"It's a little flat, really." Mr Monkey looked round the Parc. 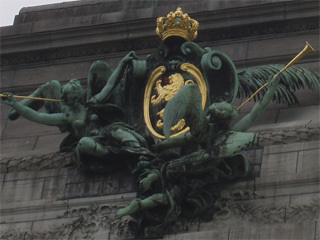 He studied the hall on the northern side of the Arc, which was one of two buildings actually finished for the 1880 Exposition. The other, on the south, got burned down in 1946. He went close to the thick hedge and was a little surprised to hear a lot of fast cars, which was a little mysterious. 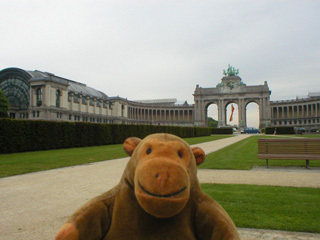 After a while, Mr Monkey scampered back to the Arc to find the military museum. 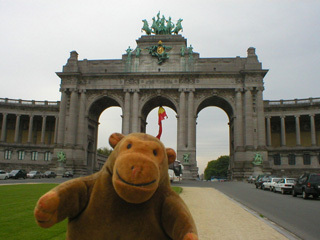 You can read about the Parc du Cinquantenaire at the Travel Info on Belgium website.